Output Name is the cell address by default. Enter a name to describe the output or click the cell reference and specify the cell containing the output name. After specifying a cell reference, the dropdown symbol changes from to . Output cell color can be modified by clicking on Cell Address. (Default colors can be changed in Help > DiscoverSim Options). Function displays the output cell equation. The equation can also be changed in this field. LSL is the Lower Specification Limit; USL is the Upper Specification Limit for the output. Entry is optional for simulation but required to produce Process Capability Indices. LSL and USL are also used as the lower and upper bounds for the desirability function in multiple response optimization. Specification limits can be manually entered or click the cell reference and specify the cell containing the specification value. 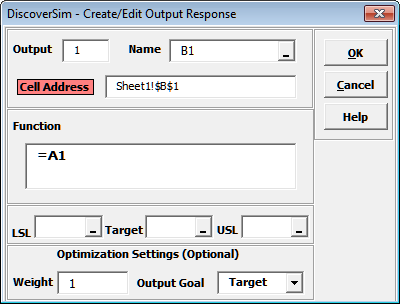 Weight and Output Goal are not used for simulation - they are optional output settings used for multiple response optimization. Note that the Output Goal (Target, Maximize or Minimize) is specific to each output. For example, if Output 1 is production rate, the goal would be set to maximize, whereas Output 2, cost, would have a minimize goal. For further details, see Appendix: Optimization Methods.